This week I felt like I was getting into the late-winter doldrums, so I decided it was about time for some imaginary travels. A winter photo of a castle seemed just right for my digital art display. 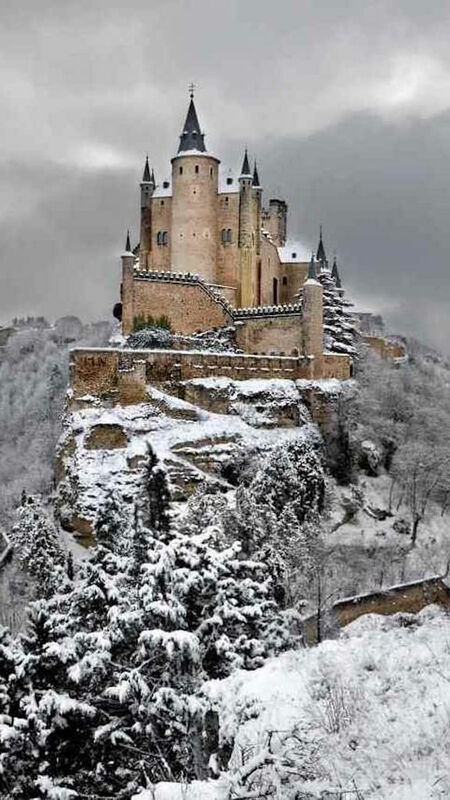 The caption identified it as the Alcázar of Segovia. I didn’t know anything about this particular castle, so I looked up the history. 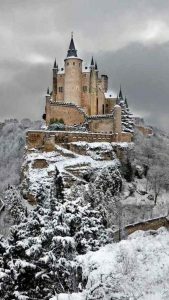 The castle was built over the foundation of a Roman fort in the city of Segovia in Spain, and many kings and queens ruled from it in the Middle Ages. Later it became a state prison and then a military college. The castle has been restored beautifully with its medieval artwork and is now open to the public. Looking at the photo displayed on my wall, I could almost imagine that I had traveled to Spain and was looking out the window of a hotel in the city below the castle. That put some fun into what might otherwise have been a dull winter day! That looks like a castle I would love to visit too! Sometimes it is possible to ‘feel’ the history in the walls of old castles. Plenty of history there, for sure — and if there are ghosts, I expect they would have a lot to say!